The HME News website reports the news as it happens for the industry. It also features blogs, webcasts, events calendar and white papers. Visit our site today: www.hmenews.com. 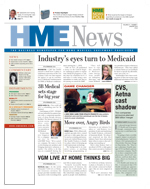 HME News Digital Edition is a fully-interactive online replica of the monthly print issue with customizable features. » Click here to view the latest issue and archived editions. HME Newswire - A weekly email providing timely news stories, with an occasional column of interest, for the HME industry. HME Most Read - A monthly email compiling the most read stories from hmenews.com, keeping you up-to-date on essential news. HME Top 5 Mobility - A monthly email compiling the top 5 most viewed mobility stories from hmenews.com, keeping you up-to-date on essential news. HME Top 5 Moneyline - A monthly email compiling the top five most viewed finance stories from HMEnews.com, keeping you up-to-date on what is most important in the industry. HME Top 5 Respiratory - A monthly email compiling the top 5 most viewed respiratory stories from hmenews.com, keeping you up-to-date on essential news. HME Showcase - A monthly email providing innovative HME products and services with photos, descriptions and links to manufacturers' web sites. Focus by HME Showcase- Emails highlighting HME products and/or services offered from manufacturers. HME State of the Industry Digital White Paper - Associate your brand with the data the industry needs. Become a sponsor of the State of the Industry White Paper. This resource guide, exclusive to HME News, provides historical highlights of valuable industry data, mined from the DMERC's statistical repository, and reported to identify trends. 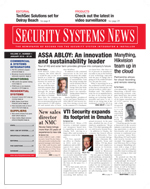 The Security Systems News website reports the news as it happens for the industry. It also features blogs, webcasts, videos, events calendar and white papers. Visit our site today: www.securitysystemsnews.com. Security Systems News Digital Edition is a fully-interactive online replica of the monthly print issue with customizable features. » Click here to view the latest issue and archived editions. SSN Newswire - A weekly email providing breaking security news stories, updates on emerging trends and links to new blogs and videos. SSN Top 5 Access Control - A monthly email compiling the top five most viewed access control stories from securitysystemsnews.com, keeping you up-to-date on what's most important in the industry. SSN Top 5 Commercial Integration - A monthly email compiling the top five most viewed commercial integration stories from securitysystemsnews.com, keeping you up-to-date on essential news in this market. SSN Top 5 Moneyline - A monthly email compiling the top five most viewed finance stories from securitysystemsnews.com, keeping you up-to-date on essential finance news. SSN Top 5 Monitoring - A monthly email compiling the top 5 most viewed monitoring and central station stories from securitysystemsnews.com, keeping you up-to-date on essential news. SSN Top 5 Residential - A monthly email compiling the top 5 most viewed residential stories from securitysystemsnews.com, keeping you up-to-date on essential news. Security Showcase - A bi-monthly email providing innovative security products and services with photos, descriptions and links to manufacturers' web sites. Focus by Security Showcase - Emails highlighting security products and/or services offered from manufacturers.